The Conan O'Brien minyon is not complete without Cyberg! I got an e-mail from my friend Threebrain last week, casually informing me that he'd be appearing on Late Night with Conan O'Brien in a bit role as ... the JEWISH ROBOT! How could Threebrain have been so "Oh, by the way" cavalier with his announcement? He knows that I'm the Jewish Robot, but he mentioned this character as if it were any of the other roles he's played, like Masturbating Bear or an astronaut. He didn't use nearly enough exclamation marks, either. In this skit, Conan was celebrating his 13th year on air. 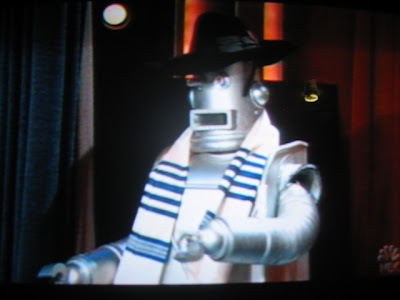 He considered it his bar-mitzvah episode. 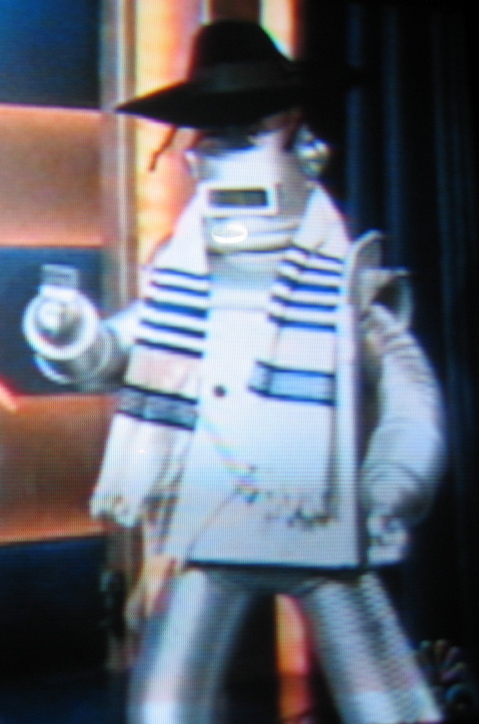 So in order to make it kosher, he summoned a minyon of Jewish characters, including the rabbinical robot, Cyberg, played by Threebrain. 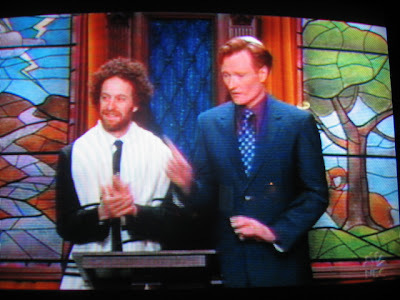 I suppose it was funny because, well, any time you mix something Jewish with pop culture, it's sure to be a hit, and rein in those wayward Jews. haha :-D wow did you photo your tv? good shots! Good article. Imma send it to my ex-girlfriend's mom. That's funny, Conan always has the best characters and skits. He should have used more explanation marks. Seriously. And you should have been in the audience.. because you know you were the inspiration for that character. Those people totally know your work.